"Mountain shrine" and "village shrine." In cases where a shrine complex is composed of multiple sanctuaries, the one located at the top or midway up the side of a mountain is called the yamamiya (mountain shrine), while the one located near human habitation at the foot of the mountain is called the satomiya (village shrine). The yamamiya may also be called the okumiya or okusha (remote shrine), while the satomiya found low on the mountain is sometimes called the shimosha (lower shrine　下社). According to generally accepted views, satomiya were first established as expedients to allow more convenient worship of kami originally enshrined in remote yamamiya located higher on the mountain. In some cases, a single yamamiya may be associated with multiple satomiya. Mitake Jinja　御嶽神社, Sengen Jinja　浅間神社, and Kanasana Jinja　金鑚神社.
. okumiya 奥宮 "innermost shrine" Okumiya shrine .
. Yama no Kami　山の神 God of the Mountains, Ta no Kami 田の神 God of the Fields.
. Umi no Sachi 海の幸 Food from the Sea.
. WKD : shiohi 汐干 潮汐（しおひ） ebb tide . In front of the temple is a bronze statue of a horse named Kurokoma [Black Pegasus] who was the beloved horse that Shōtōku Taishi used to ride to various localities to spread the word of Buddhism. It was also said the Prince often rode this horse to Ikaruga (Hōryū-ji Temple) and that the horse had miraculous powers, including the ability to fly. With Shōtoku Taishi on his back, Kurokoma flew for three days and around the country, never tiring. Shōtoku Taishi left a stone memorial to the horse, which the great Buddhist monk Kōbō Daishi [774-835] later commented on during his trip to Tachibana Temple. as part of the Mountain Religion 山岳宗教 of this region.
. Shotoku Taishi 聖徳太子 Shotoku Taishi .
. Togakushi Jinja 戸隠神社 Togakushi Shrine, Nagano .
. WKD : kuzu 葛 arrowroot, Pueraria lobata . The tight rope snaps back. Village shrines, a category of shrine stipulated under the shrine system established in the Meiji era. The broad categorization was between official shrines (kansha) and other shrines (shosha), and village shrines fell into the latter category, under gōsha. (goosha 郷社). In the gōsha teisoku (Regulations for Rural District Shrines) of 1871, village shrines were defined as subordinate to gō shrines, but gradually thereafter they came to be recognized as an independent shrine rank. Generally, shrines dedicated to the village ujigami (tutelary deity) were those stipulated as sonsha. At the end of the Pacific War, there were forty-four thousand nine hundred thirty-four sonsha; there were more of these than any other category bar those shrines of no rank (mukakusha). About one third of these sonsha were in receipt of public funds for offerings on the occasion of kinensai, the niinamesai and the shrine's own annual rites (reisai). 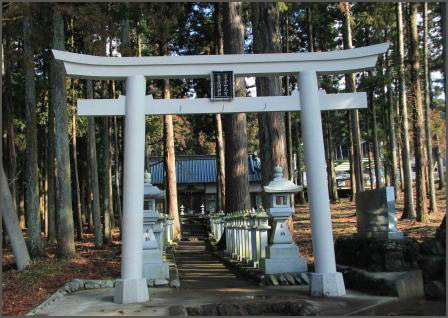 After the war, in 1946, the shrine system was abolished, and the label of village shrine ceased to have official value. 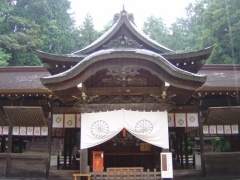 gōsha, goosha 郷社 "villge shrine"
A shrine rank instituted in the Modern shrine ranking system. The modern shrine ranking system was divided into the two general categories of kansha (state shrines) and shosha (assorted shrines). Gōsha were included in the latter category below the municipal and prefectural shrines and above village shrines (sonsha). Shrines dedicated to local protector deities (ubusunasha) in a given locality were nominated as gōsha. Under the 1871 gōsha regulations (gōsha teisoku), each district was allocated its own gōsha. In a district with multiple shrines venerating different protector deities, the most popular of them was designated gōsha. From 1922, municipal districts and prefectures funded offerings to gōsha on the occasions of the Kinensai and Niinamesai rites, and also for the shrine's own annual festival (reisai). At the end of the war, the rank of gōsha disappeared with the abolition of the shrine ranking system.
. ujigami　氏神 tutelary deity, guardian/patron deity, clan deity . - - - - - ubusuna mairi 産土神参 etc.